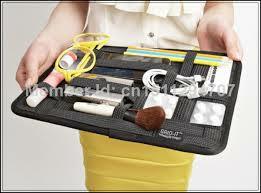 I need this organizer. Where can I get one? I bought it online and had it delivered to an address in the United States. If you are in the UK you may need to search a little more. Google, Grid It and Amazon sells it. They are called Cocoon Grid it. Let me know how you like it. Thank you for sharing your purchase! I’ve never seen it before. I’ll try to find anything like this on Aliexpress.com. Seems it will be suitable for my automotive tools. That’a a great idea to use it for automotive tools. That thought opens up a lot of other uses for it, make-up, computer tool, hair accessories, batteries, pen/pencils office supplies. I’ve seen this product and think it is really great. We all carry so much stuff around and I like how this keeps everything neatly secured. It is also simple to visually locate what you need. By the way, great tip about a purse with a light-colored lining! I find it nice at airport security. I just pull it out, put it in the bin and it has all the electronic gadgets together. One less thing to stress about in those security lines. This would also be great for someone who likes to change purchases frequently, wouldn’t it? That’s a good point too. I only change purses twice a year, lol. So I forget about how much time it takes to get ready in the morning if you have a different purse for each outfit. This would help to make the transition quicker. How wonderful that you’ve traveled the world…and am guessing that you continue to explore. Staying organized while traveling reduces so much stress. I rely on my “homes” for things and organizing routines. So when I travel, the strategies need to be more flexible. Having a parking board like Grid-It makes a lot of sense. I remember a several years ago when they came to the NAPO Expo. They were a huge hit. 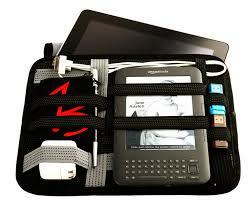 I tend to use various zipper pouches and a bag insert that has sections to help keep me organized while traveling. I agree it is all about having a system so you can easily find the small things that can get lost in a larger bag, backpack or suitcase. I do love traveling.